We heard Mrs. Alexievich speak at Cambridge and it was admittedly more than a bit of a challenge to follow her train of thought. The effort you’ve put forth in this review (and in your outstanding interview on this site) have helped immensely in making sense of that evening. Lucky to have seen this article referenced at the Lit Hub website, it definitely pushes the needle in favour of nabbing this book. Will need to do some thinking about the Chekhov association, but on the surface of it it’s rather clever. I can’t help but wonder though if the old grouch would much appreciate the comparison! You’re the second person, John Barnes, to tell me that; a friend from there also heard Ms. Alexievich at her recent Cambridge talk and said something along the same lines. She’s not hard to follow in Russian, but her answers (as I listened to her) often wander into territory unfamiliar to a lot of westerners – obscure authors or Russian folk sayings, or ironic pop lyrics from the 70s, etc. That’s something that can turn an interpreter’s work into a byzantine puzzle, making it tough on the non-Russian speaker. All that just to say that I’m glad I was able to help out. 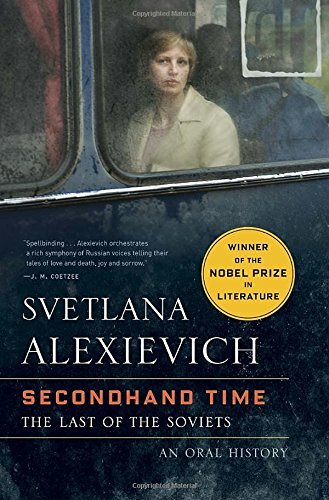 The books are worth the effort, though I might not start with “Secondhand Time”, but another of the “single topic” volumes available in English, probably the Chernobyl book.